In the world of cooking, chefs are merging ingredients from around the globe to create “fusion” food, like South American dishes with an Asian flair or standard Italian cuisine with an African accent. New and exciting food choices are the result — fun for chefs and “foodies” searching for adventure. The same thing is popular in music — sounds from around the world are fused together to make something fresh. Think steel drums blended with hip-hop beats – that’s no accident. So why not fusion gardening? In truth, home gardeners were on to global “fusing” long before cooks and musicians made it “hip.” Every vegetable garden has been a study in world harmony since tomatoes (South America), corn (North America) and cabbage (Turkey) were planted together in the same backyard plot. Early discoverers may have found the “new land” but plant hunters brought back what grew in it. A fusion garden is bound to be full of shapes, textures, colors and other surprises. Think of it as another way to organize the garden into something more personal and soulful. Fusion planting is a lesson in geography, history, plant identification, genealogy and global unity. This is an open ended project, not something that has a deadline. It’s a process that changes on a whim and through the seasons. The great thing about it is it lends itself to large or small scale planting. You can have your fusion world grow in a lot, a corner of a garden or even in a container. Getting started is easy. First of all, if you have an established garden, do a little research on the origins of the plants you already grow. That should be pretty easy since most of the plants grown in South Sound gardens like rhododendrons, azaleas and flowering cherries and plums are from China and Japan. You already have a great start on backyard globalization. With this base, you can introduce the rest of the world into your garden. And that’s where the real fun starts. * Pick a theme – Choose something that has meaning to you and yours. Do you have an affinity for Italy? Do you love England? Have you always wanted to visit Brazil? Did your great grandparents live in Yugoslavia? Every plant can have a personal connection. * Include the family — The fusion theory can bring an entire family together. Not everyone likes to pull weeds or get down and dirty, but the thought of including family history in a project just might appeal to more family members. Every age and level of gardener or non-gardener can participate. Make a list of areas that connect your family, either by birth or interest. Choose three countries that everyone agrees has special meaning. Then find out enough about the geography of the countries to get an idea about the plants that grow well there. My southern family is connected to plants from Great Britain. Germany and Sweden also figure into our family history. So, our initial list of plants includes heathers, hedge roses, Edelweiss and lingonberry, a combination that wouldn’t ordinarily come to mind, but one that has special meaning to us. * Research it — Gather some good garden books that feature your chosen countries. Learning the back story about your fusion planting makes it a deeper experience. “Principles of Gardening” by Hugh Johnson is an out of print, but easy to find, well-illustrated book that gives a sweeping history of world gardening. “Flora” is another study in world horticulture. This part of the project is a good way for the non-gardener to participate, the one who would rather dive into a good book than a pile of mulch. * Make a list — Once you have decided on a focus, and know a little bit of history, start putting together a plant list. A good Web site that seems to be made for such a project is www.worldplants.com. The home page allows you to click on a continent and get a beginning plant list. Use the Web site as a plant source or just a reference. They’ll even help you with your own plant hunt if there’s a plant with special meaning that’s hard to find. * Have fun — Sometimes gardening is perceived as only hard work, something you have to do to keep up with the neighbors, show off or add value to your home. Gardening should be so much more. If your heart and mind can see the garden as a continuing part of your family’s history, it takes on special meaning. Fusion gardening creates a new dimension that has a place for everyone in your little part of the globe, a dimension mere weeding and watering can’t begin to cover. Possibilities for fusion planting are endless. Be aware of the sun/shade ratio and try to group moisture lovers/haters accordingly. 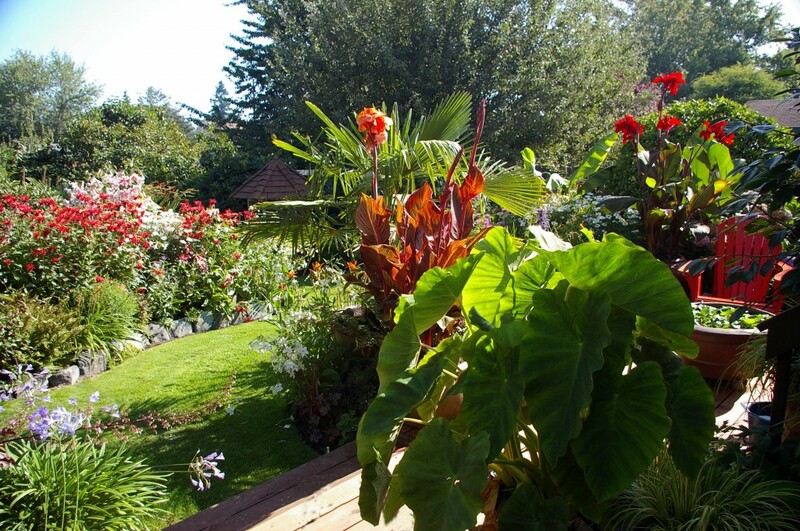 This entry was posted in Garden News, Great Plants, South Sound Magazine Article by Vickie Haushild. Bookmark the permalink.